My Father, Our Fraternity is an intensely personal memoir which brings alive the rich classical music tradition from the early twentieth century to the present. Ajmad Ali Khan offers an insider’s view of this era, through the life and times of his father, the famous sarod icon, Ustad Haafiz Ali Khan. He also affords us a glimpse into the deeply held traditions of Indian classical music, like the guru-shishya parampara, and the unique ways in which taleem (training) is imparted. As Amjad Ali Khan grows from al child prodigy to an accomplished musician, he expresses an acute sense of responsibility towards his guru and his family’s musical legacy, passed on from ancestors who created the sarod. The personal and the professional are intertwined in this book as they are in the author’s life. His friendships, relationships, and the milieu in which he has lived and performed, make for a delightful read for anyone who is interested in the classical music and musicians of India. Amjad Ali Khan is one of the undisputed masters of the music world. Born to the Bangash lineage rooted in the Senia Gharana, Khan gave his first performance at the age of six. Over the course of his career, the world saw the sarod being given a new and yet timeless interpretation by him. He has reinvented the technique of sarod playing which today is distinct in its nomenclature. He has won numerous accolades including a Grammy nomination, the Crystal Award by the World Economic Forum and has performed at venues world over like the Carnegie Hall and the Royal Albert Hall. Merried to Subhalakshmi Khan, his sons, Amaan Ali Khan and Ayaan Ali Kha, are also very talented and celebrated sarod players. When I was staying in New Delhi in the latter part of 1976 during Indira Gandhi's Emergency, the streets were festooned with banners and hoardings and buses also ran many slogans. One day I noticed a different banner, announcing a music festival in memory of Haafiz Ali Khan, organised by his son. By the age of thirty Amjad Ali Khan had become one of India's most famous musicians and I had heard him play a few years earlier in the United States. At the time I had, of course, heard of Haafiz Ali Khan and his reputation from other musicians who clearly held him in the highest esteem, but I had not even heard a recording of him. That is not unduly surprising, given the maestro's mistrust of recording, fearing that his music might be listened to in a casual way. Not only does Amjad Ali Khan show his continuing love, respect and loyalty to his father and guru but he remains resolute in his work to ensure that Haafiz Ali Khan's name, music and artistic legacy do not fade from public consciousness. In the pages of this book a whole era comes to life through the vibrant writing and wealth of experiences and memories that only a successful musician can have. Even more important than these acts of respectful preservation is the projection of the legacy into the future. To learn from a guru carries the expectation that the shishya II ill one day follow the example and become a guru in turn. The better the guru the better the shishya and the better the shishya 's own chance of becoming as successful a guru as his own. 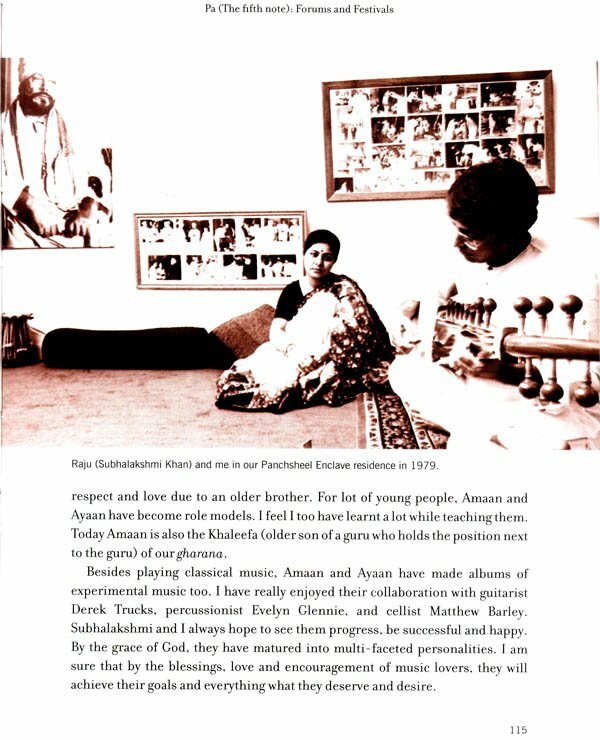 So, by being a father and guru to his own sons, Amaan and Ayaan, Amjad Ali Khan is repaying his debt to his father in the best possible way not only by his devotion to his role as fat her and guru but a I so in the fact that both Amaan and Ayaan have established themselves as successful performers on the world stage. So this book is not just about a son's love and respect for his father. I am honoured to be invited to contribute these few lines as I too feel a debt to Haafiz Ali Khan and his family, being a proud recipient in Gwalior of the award bearing his name. In celebrating the life and music of Haafiz Ali Khan, an outstanding ngure in twentieth-century music about whom much more needs to be known - as much in India, I suspect, as in the rest of the world - the book is not only about the past but also the future. Both masters, Haafiz Ali Khan and Amjad Ali Khan, were and are part of a long family and musical tradition in which a debt to the past and to one's parents and ancestors is perfectly matched - in a beautiful symmetry that is one of the glories of the guru -shishya parampara - by an obligation to the future. This is how Indian music has reached its elevated status and how it will continue to amaze and delight the world. The world knew my father, Ustad Haafiz Ali Khan' of Gwalior, as a musician who devoted his life to music. Those who knew him described him in various ways. Some called him a saint, some called him a musical genius, and some said that he had a volatile personality. Ustad Haafiz Ali Khan had many aspects to his character. However, they were all encompassed by his love for music. It is his love for music that made him, at different times, spiritual, angry, disciplined, tender, humorous, and strict. Conversely, these qualities were vividly depicted in his rendition of the sarod. The world is familiar with the musical legacy that my father left behind. However, it is yet to learn more about the human being behind the musician-a being who was filled with love, passion and humility. An understanding of his music would be incomplete without an awareness of his nature. Yet, his nature cannot be explained without referring to the music that was his life. Recently, I found myself reminiscing about the man my father was. I was reminded of how much I miss his presence and how much I revere him. It is then that I felt an urge to describe to the world aspects of my father that few knew about. I felt the desire to honestly portray his personality and his close connection with music, as I remember it. I also felt the need to speak about his associates and their effect upon me and the world of Indian classical music. I felt the necessity to pay homage to my guru. I was aware that there were aspects that had not been written about or discussed in any account of my father's life. I also understood the imperative for such a description. It was then that I decided to undertake the effort to write a book about him, as I knew him, and add one more piece to the montage that projects Ustad Haafiz Ali Khan to the world. In the process of doing so, I have grown closer to my father. I have rekindled the impact that he had on my life as a father and a guru. I have had the opportunity to share numerous nuances about his life that few know about. I have been able to share anecdotes that facilitate a deeper understanding of the music that he created. And so, this book is not only for music lovers. It is for anyone who is keen to read a book about 'human sentiments'. It is for music lovers as well. As I have said above, everything about my father was - music. Having said this, I now begin a story about my father from my perspective.